are more comfortable and they do match most of the garments in our wardrobe. But even black shoes can look gorgeous. 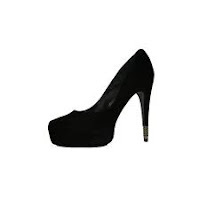 For example those ones I bought today are lovely,sexi, high heels yet comfortable and match eveything in my wardrobe. So when buying new shoes, what´s more important to you? Design or comfort? Can a woman only be sexi in high heels which cause her lot of pain, whilst she is trying her very best to hide the facial expression of a fashion martyr. Fortunately for us women even flat shoes can be sexi and fun to wear. Important is not only the design, but the shoes must fit and somehow match our personality - we have to be comfortable with them and feel sexi and cool about them, even if we are wearing trainers. Just like clothes they must become our extra layer. They have to be convincing. There is no general advice when it comes to buying shoes. You know that feeling when you pick up a gorgeous pair of shoes, which you have seen in a magazine and it costs half of your month salary, you try them on and even though they are not very comfy, you come over to the counter and purchase them.You come home, knowing that tommorow you have to go work and you are definitely NOT going to waste your new gorgeous Fiorangelo shoes for that. You decide to wear them to the date with your new boyfriend, and naively believe that you are going to be irresistable. But when you come to the nice restaurant for romantic dinner, you realise you can´t even walk properly and you your "catwalk" it´s far away from what we see on the runway shows. You look and feel insecure, you stumble, fall over and romantic dinner is ruined, not to mention that the beautiful, expensive shoes are damaged. You start to think that maybe it would have been much wiser to buy those simple black shoes instead. At least they would fit you better. More is less and what looks gorgeous doesn´t always do the right job. As the great Ralph Lauren said: Women should not look like fashion victims. So ladies, good luck with all your future shopping and hope you always pick the best choice for you. Hi.......these designs are looking nice particularly the red tops are awesome!!!!!!!!!!! !